Why can’t the pine snakes cross the road? Hint: New Jersey traffic might have something to do with it. Drexel students will bring to light these and other findings about the plight, perils and peculiarities of the Northern Pine Snake in several presentations and posters at the Ecological Society of America annual meeting next week (ESA 2013), based on their research with Dr. Walt Bien’s Laboratory of Pinelands Research in the New Jersey Pinelands. 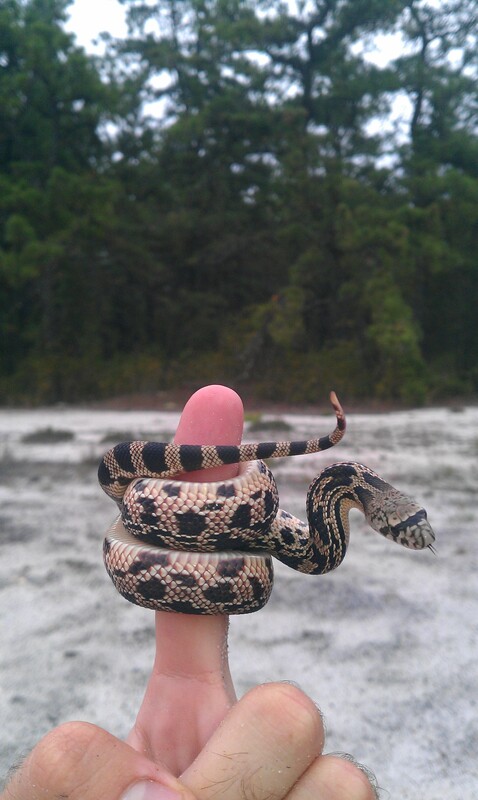 Northern pine snakes are charismatic ambassadors for the Pinelands National Reserve, an ecologically important region –designated as a U.S. Biosphere Reserve by UNESCO and as the first National Reserve in the United States. The pine snakes are large, nonvenomous, docile and beautiful (at least to the non-phobic). The population in New Jersey is threatened, and the next-nearest population of northern pine snakes is in North Carolina. Protecting these snakes from the human-generated perils in the most densely populated U.S. state can go a long way toward protecting the entire ecosystem they are a part of. Dane Ward has a rare talent for a graduate student in conservation biology: He is an adept snake surgeon. Many animals are studied using radio telemetry by attaching a radio transmitter to the outside of the body. 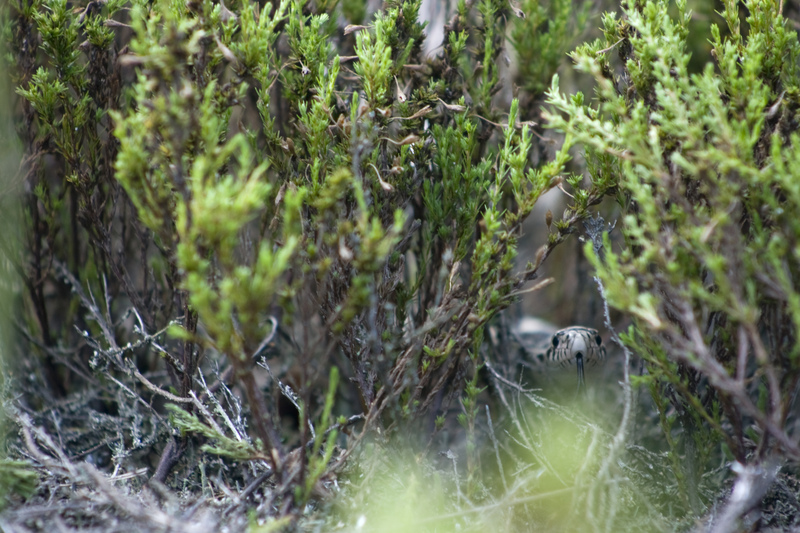 Radio telemetry is useful for tracking pine snakes because their movements are hard to see through simple observation. But placing a transmitter on the surface of a pine snake’s skin would interfere with the animal’s slithering movements and feeding via constriction. 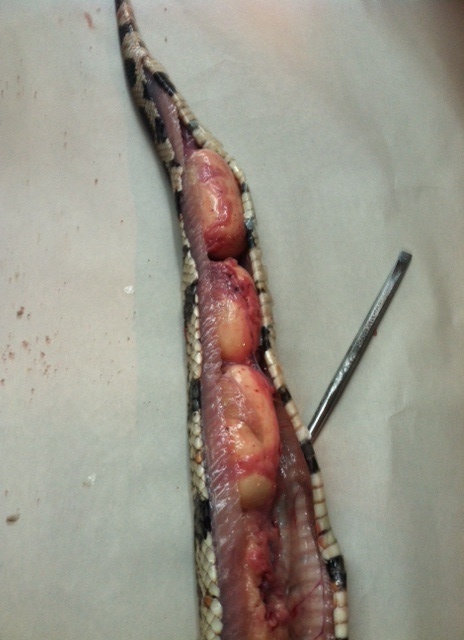 So Ward has learned to surgically implant the transmitters in snakes instead, through a tiny one-inch incision. The team has radio-tracked more than two dozen adult pine snakes in recent field seasons. The data have helped them learn more about the snakes’ spatial range and behavior and develop population models they hope will be useful for conserving the locally threatened population of pine snakes. Ever feel lethargic on a hot day? It’s worse for snakes. Radio tracking pine snakes gave Ward and Drexel undergraduate Catherine (Katie) D’Amelio an opportunity to take an unusual approach to studying climate change. 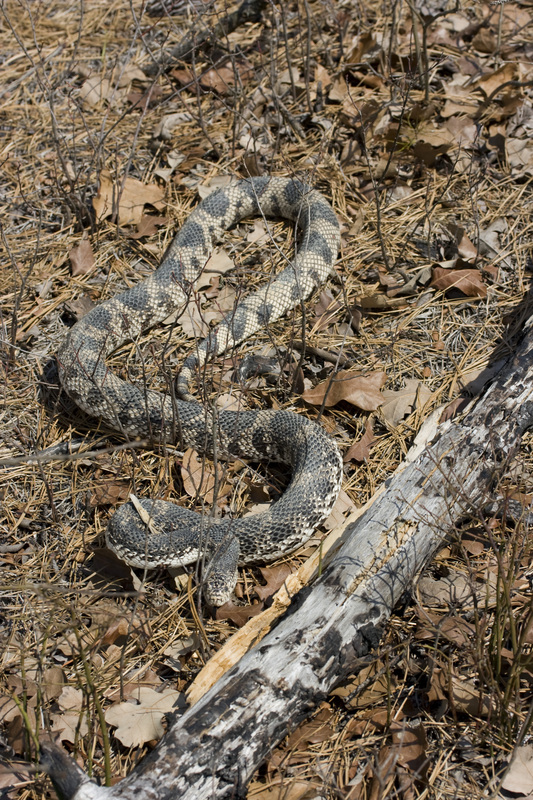 Because snakes are cold-blooded, and New Jersey is the northern limit of the pine snake’s range, they reasoned that shifts in weather and climate could have an impact on their behavior. D’Amelio looked at the data from snakes that had been tracked over three seasons, and compared their activity levels with the air and soil-surface temperatures the snakes encountered. At the highest temperatures, snakes’ activity levels dropped off. Comparing the snakes’ most active temperature range with predictions of shifts due to climate change, the team pointed out that the timing of seasonal activities may shift in the future – which could impact their interactions with other species. And they note that freezing to death could be a danger if early-spring warming periods, followed by cold snaps, become common – something they observed in the spring of 2012. D’Amelio won a top award at the Mid-Atlantic regional ESA meeting earlier this year for the poster on this work – earning her a trip to present it at ESA 2013 in Minneapolis. Graduate student Kevin P.W. Smith has the study of neonate snakes wrapped around his finger. Nesting and early life for a newborn, or neonate, pine snake, are life phases that scientists know the least about. But graduate student Kevin P.W. Smith is deeply involved with changing that. He’ll give an oral presentation Tuesday at ESA about some of the first work ever done to study the behavior of neonate pine snakes. 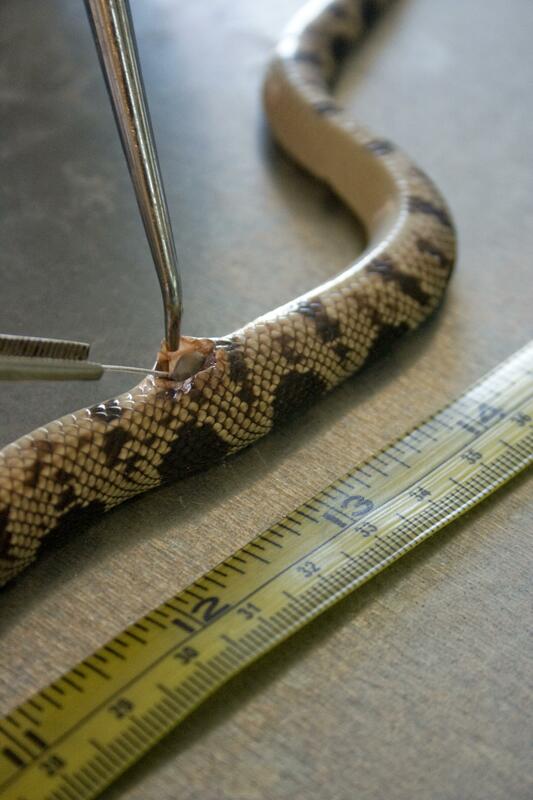 Because neonate pine snakes are tiny and hard to see, once again, snake surgery is required (and the surgical photo above is of Ward implanting a neonate with a radio transmitter). To find neonates in the first place, the team tracks adult female snakes to their nesting sites and marks the spot with GPS. In the Pinelands, female pine snakes dig out their own burrows over the course of several days, using a specialized scale on their noses to scoop out sand – so it’s not too hard for a careful observer to catch some females in the act of digging prior to laying eggs. Two months later, the newborn snakes emerge from the marked burrows into small fenced-in areas rigged by the researchers to capture them. A neonate northern pine snake, captured by Smith for this photo in a “snake’s eye” point of view. 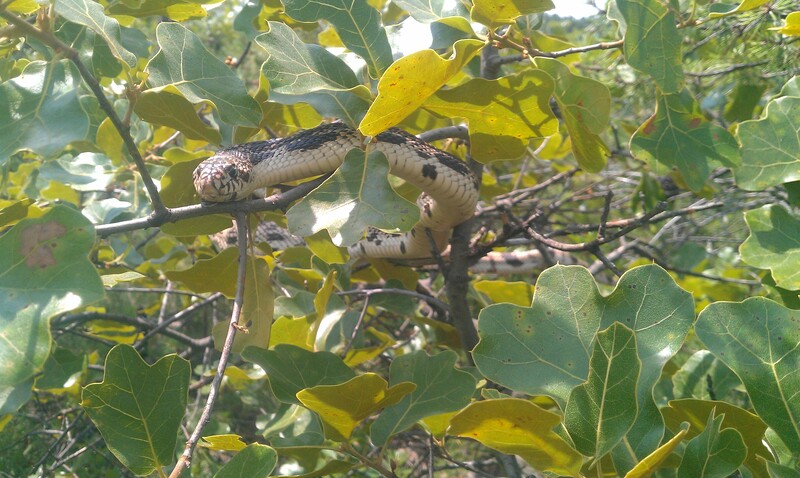 Smith has been able to make important observations about the neonate snakes’ natural behavior. For example, he learned that young pine snakes begin feeding on adult mammals – small ones, such as mice – within the first two months of life and they shed their skin multiple times within their first season. He has also been working with neonate pine snakes in a variety of behavioral experiments, including simple maze tests to track migration and dispersal responses to different snakes’ scents. In another experiment, he counts the neonates’ tongue flicks to gauge their interest in the scents of various potential prey items. Why can’t snakes cross the road? 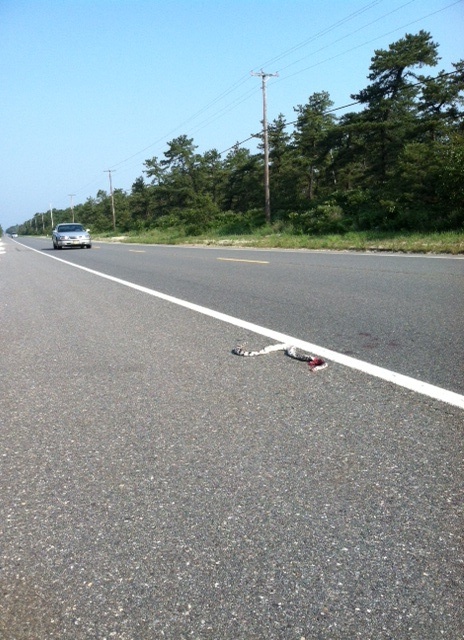 No joke: Pine snakes in New Jersey tend to get flattened on roads, and scientists speculate that summer shore traffic could be a big contributor to snake mortality. (Some motorists tend to think of the Pinelands not as a rare and special natural environment for plants and wildlife, but as the woods on the way to the Jersey shore.) Just how often and why, and what that means for their populations’ survival, is the subject of intense research. Two Drexel undergraduates who joined Bien’s lab in their freshman year last year, Jacquelyn Garcia and Rafaella Marano, are working with Ward and other members of the team to address this question, and will present a poster about their road-crossing studies at ESA. They found that crossing a two-lane highway takes pine snakes about two minutes. When they cross-referenced that time against New Jersey traffic data for the roads crossing their study area, they found that snakes were virtually guaranteed to encounter several cars during any road crossing – anywhere from 3-4 cars crossing the least-used road, to more than 30 cars per two-minutes on New Jersey’s Route 72 during the busy summer season. They also studied the effects of the type of road surface on snakes’ movement and found that snakes move faster on sand than on asphalt and concrete. 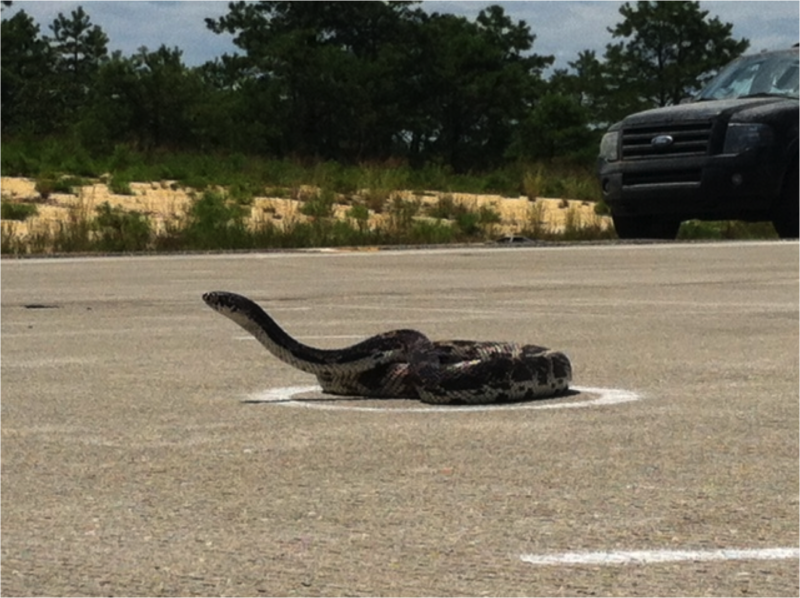 A snake in a substrate experiment: How quickly can it cross this road, compared to one with a different type of surface? Snake deaths on roads aren’t just a gruesome accident – they can be a real problem for the population dispersal and survival. Roads dividing the snakes’ habitat can effectively fragment the population by preventing interbreeding with snakes on the other side. Some of the team’s ongoing work uses biological samples from the roadkill snakes they find, to determine if roads are causing noticeable genetic differences in the population. They’re continuing to investigate whether culverts under the roads can provide safe crossings and will also test whether changing the surface texture of the road can help snakes cross more rapidly. All of this snake research and much more is possible because Bien, a professor in Drexel’s Department of Biodiversity Earth and Environmental Science, and his students, have been welcomed to work in environmental protection on the U.S. Air Force’s Warren Grove Gunnery Range. The government is required under federal law to protect this property – and the Drexel researchers have helped them do just that, via a partnership with the Air Force and New Jersey Air National Guard lasting more than a decade. Read more about their work in EXEL, the Drexel University research magazine: Snakes on the Base. And, please, if you’re driving through New Jersey, slow down and let the snakes cross the road.